grasp your second phase; the dynamic of pushing yourself to discover your untapped potential at a level not yet reached. The creation of the logo is due to the need of a branding emblem that is versatile enough to represent a person without the use of words. The logo needed to be screenshot or summary of everything that Phase 2 embodies. From a marketing aspect, the logo is an essential element in the visualization of a entity or product that will be seen alongside their being. Specifically in regards to Nike marketing, this logo supplements the aspect of a player exclusive branding element that can be used in several products. The second phase is the next level you strive to conquer; the evolution of your current state; the progressive development and advancement towards a goal or to a further or higher stage. 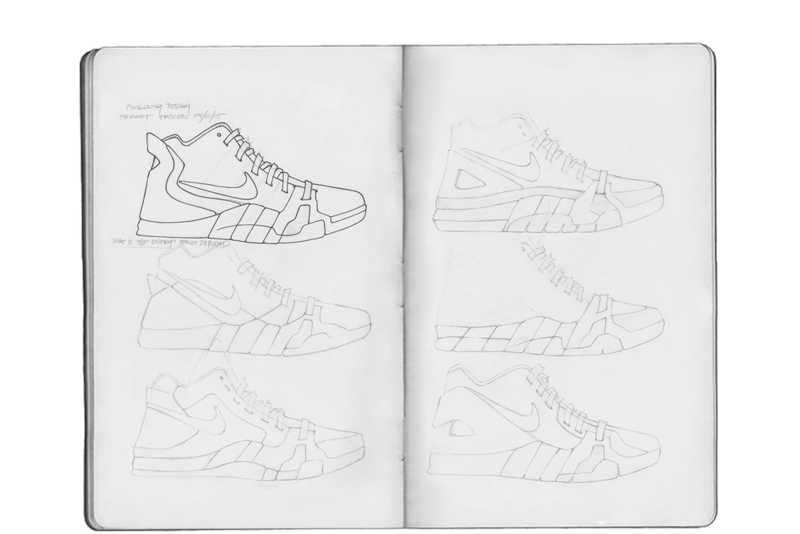 The sketchbook houses all of the conceptual design components. The process of creating with a constant stream allowed for both good and bad ideas to surface which played a key role in refining different aspects of the design. I. The Golden Gate Bridge is the essential or main (maine) subject of inspiration. The toe box bracket goes from lateral to medial "bridging" both sides providing a sturdy casing with lightweight outsole material. 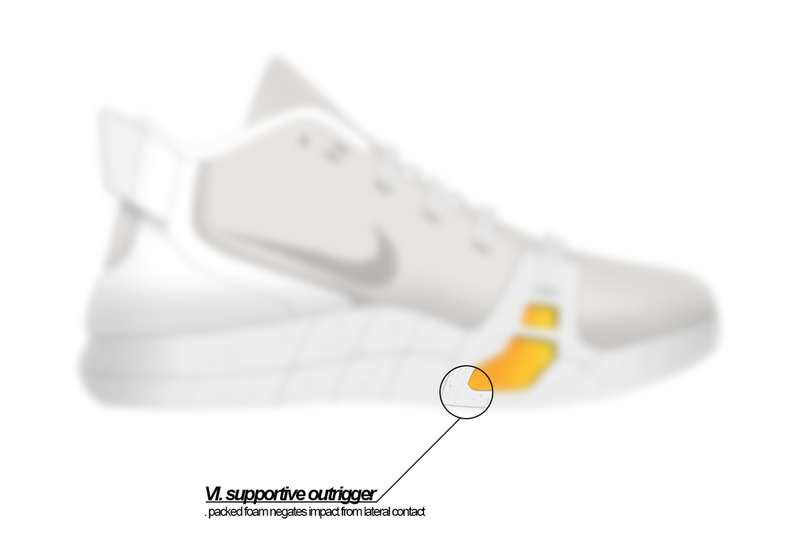 The cables are represented in the outrigger acting as a support that wraps around the outsole's high stress sections, adjacent to the bridge bracket. 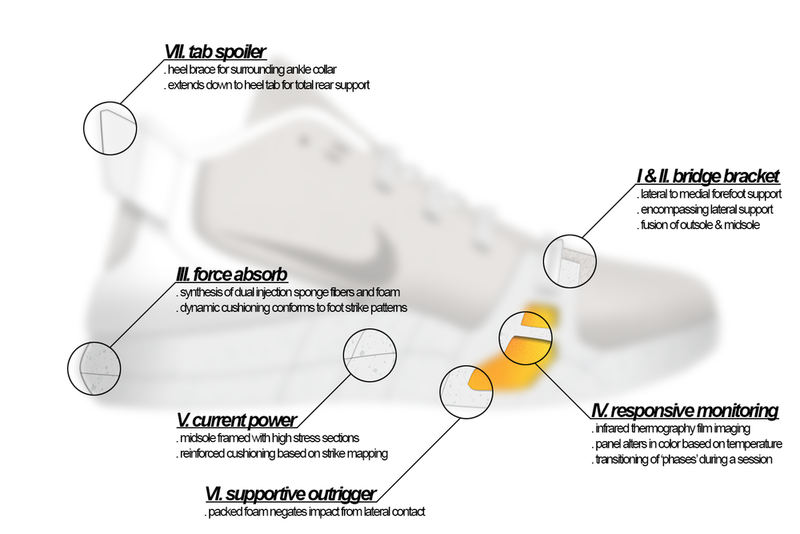 The paneling is the influence for the the heel tab unit including the pull tab. The heel tab surrounds the ankle collar for encompassing support. II. The Air Jordan XXXIII, designed by Tinker Hatfield, shows it's influence in the silhouette. Ironically, Phase 2's favorite design, it houses shapes and lines associated with other sources of inspiration which makes for a synergistic design. III. Phase 2 started collecting in 2002 and evolved into a knowledge sponge. Sponge fibers are the main technology present in the outsole unit. Made form cellulose wood fibers or foamed plastic polymers, the dual injection molded unit contains sponge fibers that absorb impact from foot strikes into the rubber sole. IV. When faced with the issue of showing the process of achieving the next level, visualization was needed. Heat sensitivity allows panels to change and indicate specific colors depending on temperature. At a cold state, the panel will display a different contrasting color than a hot state. This allows the player to show when they are "heating up". V. A polyphase alternating current is a specific electrical power distribution system using two circuits. A two-phase electrical power chart shows the voltage phases differing by one-quarter of a cycle for 90 degrees. 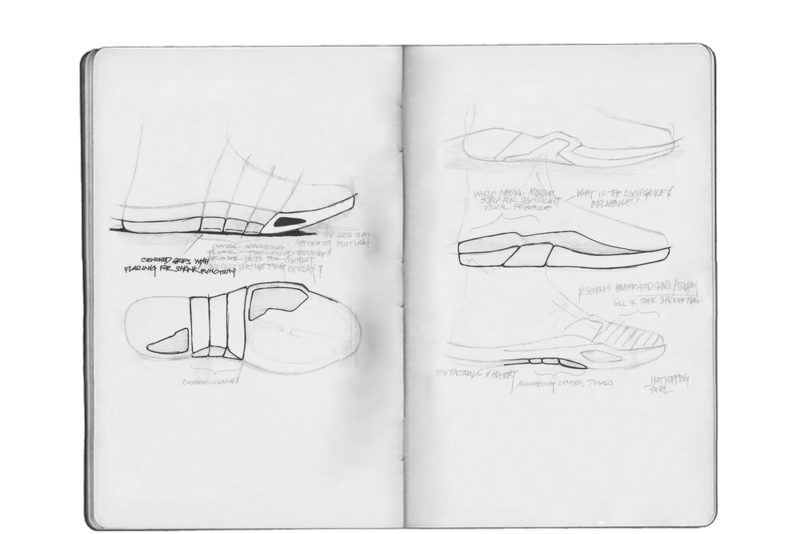 The lines of the phases are represented in the midsole frame, and ironically are present in the XXXIII design, although not mentioned in the design development of the Air Jordan model. VI. The Arctic Circle is the region of the portion of the globe that passes through 1/3 of Alaska. The lines in the supportive outrigger are arranged in a sphere pattern that extends from the lateral to the medial midsole. VII. Mandy is the name of Phase 2's red 2000 Honda Civic EK hatchback. 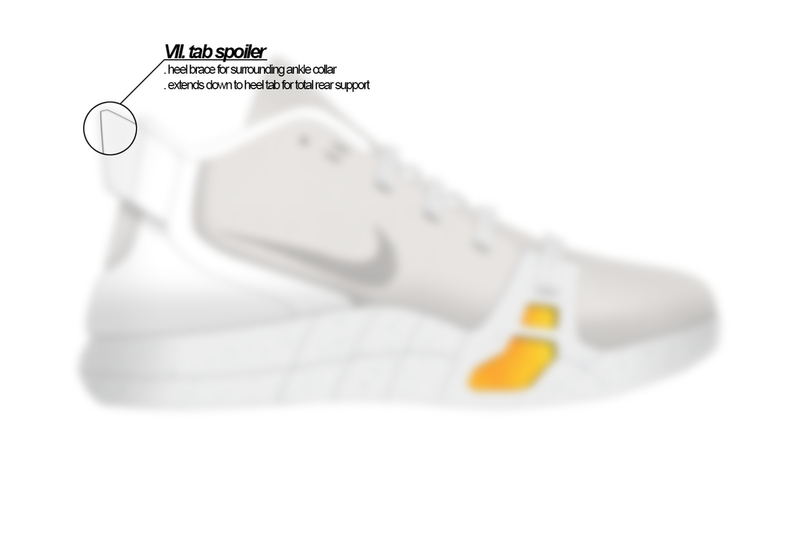 The Heel tab also acts as a spoiler representing that of the cars. VIII. The Devotion for the Golden State Warriors, particularly the 2006-2007 roster, plays a significant part in the design direction from the lines to the colorways. Ironically, the primary colors consisting of royal blue and gold are all present in the state flags of Phase 2's home state of Alaska and present state of Oregon. Each piece of inspiration plays a pivotal role in the technical design and is prevalent throughout. Furthermore, the design incorporates all of the functions to provide a harmonic flow in aesthetics. Sustainability plays a major role in the construction design. 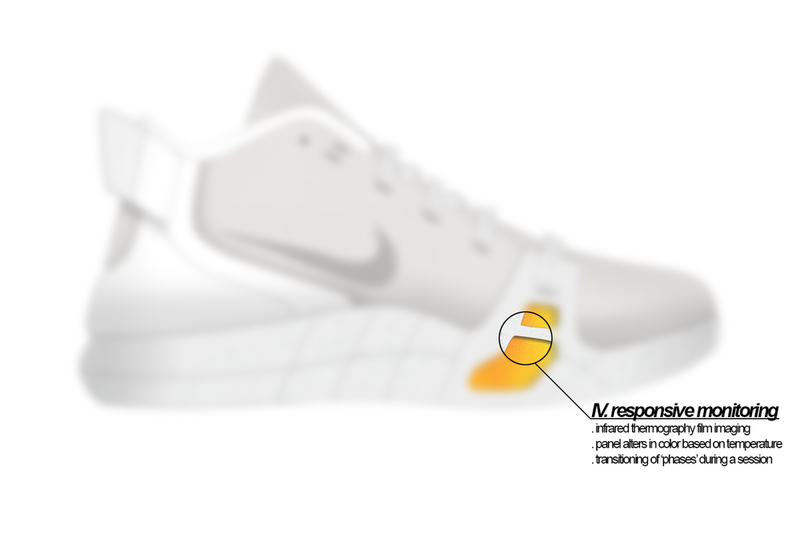 The Nike Materials Index (Nike MSI) is used to select environmentally better materials and are assessed in four areas comprising of energy, chemistry, water, and waste. The above and below graphs display the values of each the corresponding materials that will be used in the construction process and their respectable environmental impact. To support Nike's sustainable innovation initiative the materials being used are a combination of current fabrics and composites as well new elements. Leather composite and recycled polyester fabric will be the main materials used in the upper portion. The midsole will be comprised of a polyurethane TPU foam and sponge fiber synthesis. The innovation of the sponge fibers is the ability of the material to mold to the foot with reinforcement capabilities. The outsole will be comprised of a environmentally preferred rubber that will provide superior traction. I. Blackout - reverse edition cloaking the heat mapping panel. II. Alaska Royal - corresponding to the Alaska and Oregon state flags. III. Golden Gate - giving accolades to the city of San Francisco. IV. 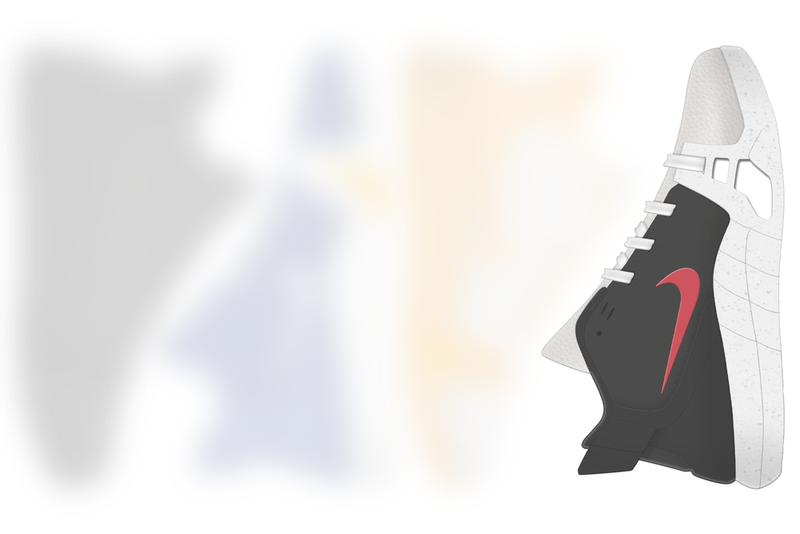 Orca - classic color combination for the ages. Inspired by the Killer Whale who can be found in the Arctic. V. Mandy - a nod for Phase 2's red 2000 Honda Civic EK hatchback VI. U of O - University of Oregon's school colors. VII. Playoff - traditional black and white used in post season. VIII. PDX - influenced by the unique patterned carpet at Portland Airport. The two main focuses through marketing campaigns is sustainable innovation and the development of the different phases. I. The focus on sustainable innovation plays a key role in marketing the product allowing the story to tie in with the technology and environmental efforts. The recycled sponge fibers provide a deep story line that can incorporates Nike's sustainability efforts. II. Several campaigns can be developed by marketing the different phases. The infrared thermography film imaging panel can be visually represented in countless ways. Since the panel alters in color based on temperature, each campaign can focus on a specific phase. In coordination with marketing efforts the goal of generating a buzz and gaining notoriety should be organic where the consumer seeks the goods themselves. The curiosity of seeing the exclusive pairs among select individuals and outlets should develop a sense of inquisitiveness. Through a minimal, yet strong marketing campaign, the Phase 2 can create pure interest through second party sourcing. Traditionally, player exclusives (PE's) were not made available to the public and needed to be thoroughly sought after to obtain. As of late, PE's have slowly been making retail headway, most notably with the Air Jordan XIII Retro CP3 released November, 07 2015 with Chris Paul's signature branding on the tongue. The Phase 2's will release on Nike.com on September 10, 2016 at 12:00am (9:00pm PST). I am very appreciative for your visit.